Today before I continue with my painting demo, I thought I would mention the colors I'm using on my palette. For many years I stuck with a fairly limited palette of about 5 or six colors (cad. yellow light, cadmium red, alizarin, ultramarine blue, pthalo green and white.) This was great for me as it really pushed me to learn how to mix color and not become reliant on pre-mixed colors from the tube. It also really helps lighten the load when I am packing my gear to take my studio outside and paint en plein air. But these days in the studio, my time is more limited. I have a finite amount of hours each week to paint, blog, frame, ship, not to mention cook, eat, sleep, and care for my family. So I have allowed myself the luxury of an expanded palette to speed things along in certain areas. For instance, while I know how to mix secondary colors and some decent earth tones with a limited palette, things can move a bit faster if I have some premixed secondary colors (a.k.a. "convenience colors") in my toolkit. So, for instance, red+yellow= orange., but cadmium orange is still a nice color to have both for it's purity and intensity and its convenience. 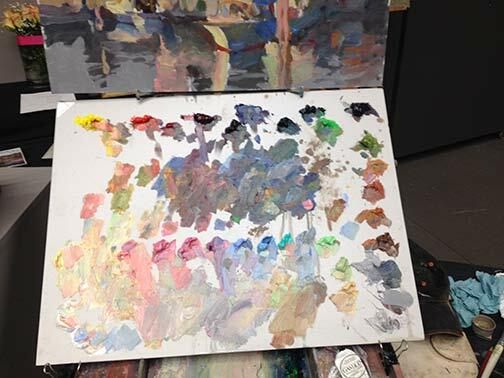 In any case, whether I am using primaries or secondaries or pre-mixed earth colors, there is still plenty of color-mixing along the way, and I don't ever use any color straight from the tube on my canvas. Now that I've gotten that bit of housekeeping out of the way, let's get back to painting! I spent my last post addressing the "shadow family" in this scene. In this picture you can see that much of the busy market scene is now at least suggested. But light is needed to delineate the forms and bring the scene alive. These images are a bit dark as I did not take the time to color correct the in-progress shots. But hopefully you can see that my approach has been to just focus on the general shapes of things without getting too bogged down in details. There are basically three large shapes of light spilling over this painting: the sky, the pavers, and the white awning, with lesser highlights on the figures. Here is the final stage. I have kept things fairly loose because I wanted to keep the focus on the foreground figure, while still maintaining unity throughout the painting. Notice the difference in the color of the final piece below, taken under better lighting conditions to show the true nature of the colors in the painting. It's taken me a while to get to blogging about this painting because after a disastrous automatic update to Windows 10 my computer died. It has actually been grinding to a halt for a while but it finally kicked the bucket for good last week and I have spent the past however many days trying to relocate my data and reinstall my applications. I am still operating on the bare minimum but at least I can blog again! I won't go on about it but just imagine to appropriate amount of ranting and hair-pulling and insert it here. Aaany-hoo, back to art! Next, I want to think in terms of light and shadow by separating out which parts of the painting are in the light (the light family) from which parts are in shadow ( the shadow family). I will start with the shadow family first. I learned this terminology from Kevin Macpherson, one of my teachers and a phenomenal painter. Phrasing it this way helps me to organize my thoughts and approach, beyond just saying "lights and darks". It's so helpful to see it this way because in actuality some things in shadow are quite light, though they are never lighter than what's in the light family. I spend a lot of time working in the shadow family because so much of the strength of the painting is here. Only then do I start working in the light. More stages next time. I hope you'll tune in as I work on lighting this bad boy up! 'Tis the season for small paintings! This time of year, galleries promote their artists with small works shows for the holidays. There is a good reason for this. Small paintings are a nice way to start an original art collection or offer a unique and thoughtful gift without breaking the bank. With that in mind, here is a little 6x6" painting in water miscible oils of a quaint little street in my home town. This is a well known Episcopal church on Virginia Street in Ashland. I experimented with a lot of different angles, but they all seemed a little too much like "look at this church!" and not enough like "look at this sweet painting". Finally I found a composition I really loved. I wanted this to have both a sense of place and a sense of the lovely light of autumn. The leaves have been falling off in droves from all of the rain we've had. But at its peak, this humble little street displayed its foliage like a proud peacock, and I am really glad to have captured it. I took a couple of progress shots to record the architecture (har har) of the painting. They were a very few, both because this is such a tiny piece, and because I forgot to photograph the first step, which was the monotone value sketch (done in my usual manner). While it lacks the nuance of a larger, more developed painting, the process below shows my general approach to building a painting regardless of the size. In some ways, the simplicity of the piece helps to demonstrate the importance of creating a strong structure right from the start. Post- tonal sketch, I begin mapping out my shadow patterns. The darks act as the "bones" that hold the painting together. Even at this stage you can get a very good idea of the strength or the weakness of your painting. Are those values spotty? Disconnected? Or do they lead the eye in and around the painting to the focal point? What is it about the light family that makes us want to jump right in and start painting it? What representational artist has not said, "It's all about the light"? But here's the kicker. The light doesn't hold up unless you have the shadow to support it. Shadows first give the painting its form, then that gorgeous light can follow. At one time I painted a lot of "minis" (6x8" and under) both en plein air and in the studio. They sold well, but I got really burnt out after a while and longed for more opportunity to massage my ideas into something more fully developed, more refined. But now, upon request, I am revisiting the concept of the "small stuff" for its own sake. I have to say, there is something to be said for the simple statement. It lends itself so well to the direct approach, and there is a freshness to it that says, while perhaps not everything, sometimes just enough. Last week I did something I haven't done in a very long time...devote myself to the art mistress from morning to night for an entire week. And it was a week studying with the talented Kevin Macpherson at that! As you may have read from my previous blog posts, I am a big fan of his paintings and his books. He is truly one of the best teachers I have encountered so far. Not only is he a highly skilled painter, but he has a way of honing in on and distilling essential information that actually penetrates my rock-hard noggin. The workshop took place in a beautiful new space called Chesapeake Fine Art Studio, run by artist Hai-Ou Hou in Stevensville, MD (great location- about 20 mins. away from Annapolis). If you are an artist on the east coast, it would behoove you to check out her site. Hai-Ou is quite the painter herself, and also appears to be drawing some of the best and brightest painter/instructors in the plein air and traditional/representational painting movements. I really wish I had time to delve into all I learned during my workshop experience, but life is slamming me pretty hard right now. This week marked a return to the "real world" (insert the sound of needle scraping across a record here) with kitchen renovation, school activities, and doctor's appointments commanding most of my time and energy. But my biggest takeaways from Kevin's instruction had to do with value and composition. He spoke a lot about light and shadow, and how one can create much stronger paintings by clearly indicating which elements belong in the light family and which belong in the shadow family. (This sounds simple in theory but it isn't always so easy in practice.) He stressed seeing and painting "shapes, not things", with the idea that if we are too wrapped up in painting a "thing" we lose the ability to really see it accurately and how it relates to the rest of the painting as a whole. We spent a good deal of time really learning how to see the true value of things (er, shapes, that is!) He stressed using a color isolator in the field to identify true value and color, determining and laying down your darkest note of color first, followed by the rest of the shadow family, and finally the values in the light family, keying everything up from that very darkest note, so that you really can get a handle on color and value relationships. In essence, how dark you key your darks will determine how light you key your lights. I use the analogy of playing "Chopsticks" on the piano. You can play low on the scale or high on the scale, but the arrangement of notes and their relationship to each other are the same no matter how high or low you move along the keyboard. His demos didn't disappoint. 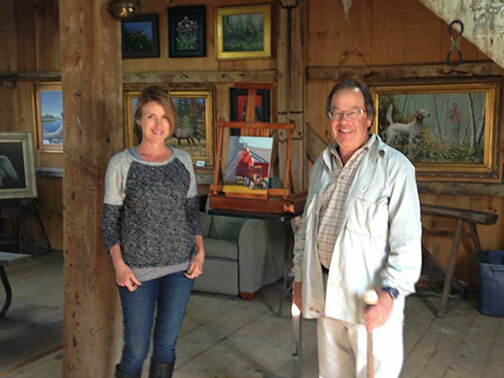 In addition to demos in the field, mid-week during his opening he did a remarkable demonstration in the studio (from a photo) on a canvas sized at about 20x24" . During that opening he also presented an inspiring and highly entertaining lecture. 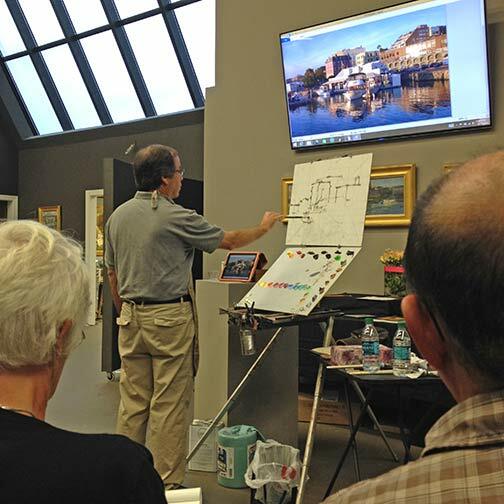 This lecture, I understand, was very similar to the one he presented at the Plein Air Convention. Not being able to travel as much as I used to, I really appreciated having the opportunity to see this presentation, in a much more intimate setting. Though we were meant to work largely out of doors, we had our share of rain and wind. When the weather didn't cooperate, it gave us the opportunity to study (in the gorgeous and spacious studio) some of the more pertinent points Kevin was trying to drive home. We spent a good deal of time studying value relationships among the "light family and shadow family". On another occasion we delved into "The Golden Mean" or "Golden Section" (the informal subdivision of space) and he presented a fascinating slide lecture with many, many inspiring examples of how it has been used by painters throughout history. At the week's end, I left feeling completely exhausted and totally exhilarated at the same time. I didn't leave with many "finished" pieces, but that wasn't my goal at all any how. What I did leave with was a wealth of knowledge and insight, as well as a good deal of creative spark. Whether that spark ignites a fire, is now totally up to me.